Cover Week came to a crashing end as I miserably failed to refine or update the hump molded dish I was working on for what seemed like hours the other day. I have a few boards of these dishes but called it quits when I wasn't getting the results I wanted. 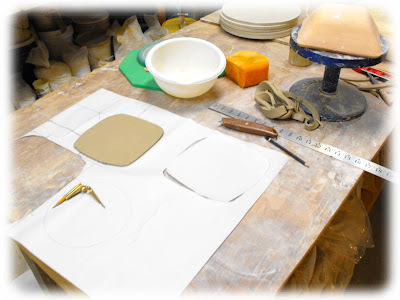 I had come up ,with a way of making a big loaf with the size and shape that needed very little cutting, shaping etc. I had marginal success, but wished I had made new hump molds. and the life of an art form eventually requires the last. I guess my out of the box expressions would have benefited from more time. More an exercise than an expression, the covers helped me to understand outside of my box and gave me some ideas to follow up on in the next session after I fire these. Far from complete replication, these offered me a way to throw myself off course just a little by forming unfamiliar shapes and reacting to them in a spontaneous progressive sort of way. Here are a couple of shots of my table where I did a lot of head scratching and slab rolling and hump molding. Most of the molded dishes were tossed out, but I did save a few to fire. After the day (a week) of experimenting, I needed to make some pots that were reassuring and familiar so I made a bunch of 9 lb. bowls. 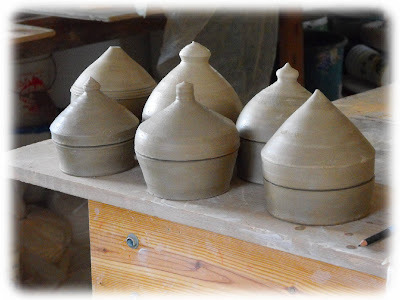 So at the end of Saturday night, I felt I hadn't wasted a day chasing butterflies, but had some pots that I really needed for the upcoming firing. It's good to mix the practical with the exploratory! 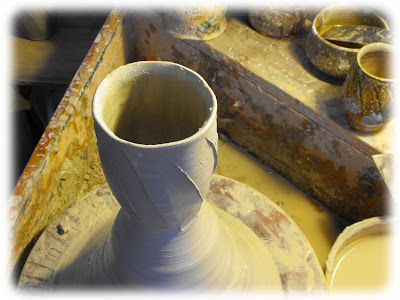 The vase/bottle forms got a coating of my kaolin slip and I did some combing through the wet slip. 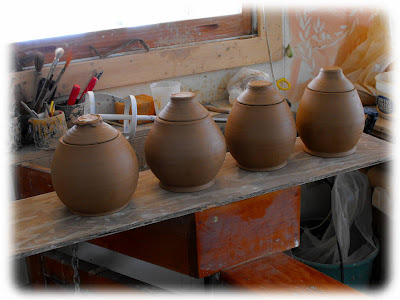 Next I will do some brushwork on glaze these in my amber/tenmoku. This form was one of my most satisfying research project even though it started out as something slightly different. 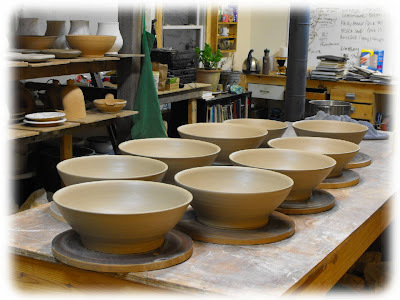 Here are the 9 lb (4 kilograms)(0.6 stone) bowls that I made Saturday evening. 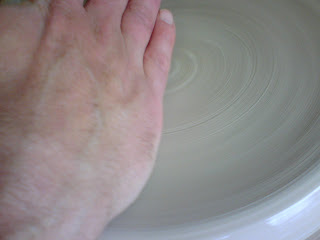 Sunday was overcast and the light coming from the window to the right of my wheel was great for seeing the line of the platters I threw. I turned off the overhead lights and was able get a good sense of the line from the lip to the center of these platters. For the past week I have been using Highwater clay's Zellastone and it took a while to retool and approach this commercial clay body. It's been a real relief and convenience to just open bags for a change. But I can't wait to get a back hoe over here to get a few years supply of the red stuff to mix in the coming spring! The Zellastone is quite a bit more smooth that my red dirt mix and wooden tools didn't work so well. I switched over to some metal ribs and got some really nice results. The above picture shows the shadow from the nearby window that is very helpful when using the metal ribs to get the inside of the bowl just right. For some reason when I'm using the red dirt clay, wooden ribs get the results that are pleasing. Could be the smooth clay versus the course red dirt clay I normally use. Here's the platters I threw this afternoon. The bowls from last night were turned over and then covered with plastic to even out their dampness. 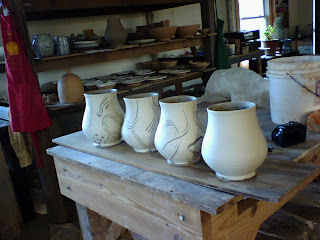 I'm going into the home stretch for firing 34 and will try to keep all of you informed of the goings on around the shop. 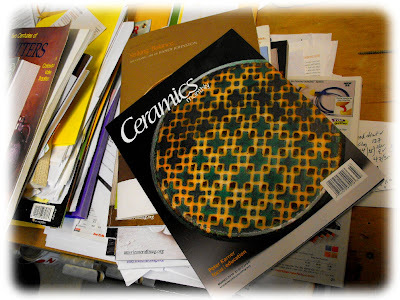 February saw the biggest traffic ever at the blog and I hope you will continue to read and share with your friends who may also like to see more pottery in 2010. Please notice that there are a couple of new ways to share the blog with others who are yet hip to "Sawdust and Dirt" after each post. Just click on the facebook link to share to your "wall" and tweet the blog if you are so in-klined. I'd love to continue this conversation tonight, but I'm very tired and need some sleep. Big weeks ahead. Just wanted to share a few thoughts about the week's end. Leave a comment, I'd love to know what you're thinking about. 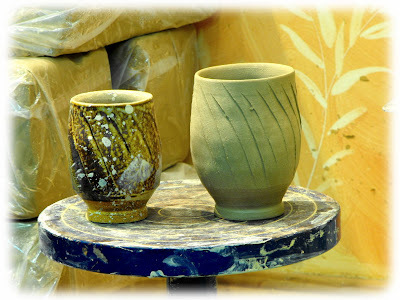 More coming tomorrow ( a new poll) and a lot of pottery in the weeks to come! Best rib(?) ever for platters. One Rather Long Ramble: Or Am I Going To Ever Going To Get Back to the Wheel? Somehow it all makes sense I guess. There are things in your life that have their influence on you, people, pots, and finger paintings! I just saw this drawing as I was putting together this morning's post and thought, "oh, that's interesting." It could be that I'm drawing conclusions or implying that this drawing has influenced me in some subconscious way when really it just hangs on the door that we go in and out of all through the day. Now I'm confusing myself. 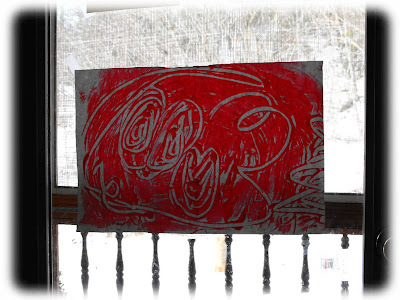 Anyway you can draw your own conclusions or draw your own finger painting, or just draw! When I was at Highwater Clays the other day I bought a bag of Grolleg kaolin for my #6 Tile kaolin slip. Go figure. I call it T6 slip, but it has a little bit of Grolleg in the recipe. It's a recipe I got from Linda Christianson somewhere down the road. It worked really well, so why change a good thing? Well that bag of Grolleg kaolin was $44! Yes, I know it is from England. Yes I know it probably one of the world's best clays. But come on!! I tell myself that it's just a small portion of the recipe and the bag will last a long time. But come on! I putting it on dirt! Oh well. If it works is there a reason to fix it? 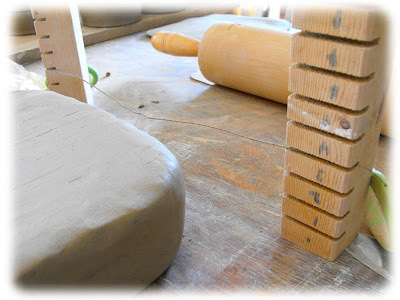 Oh yes, I pour the slip on the slabs, spin the bat that the slab is on, and then comb away. 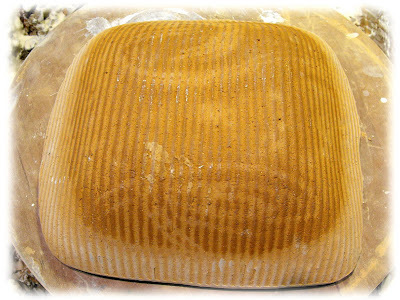 Here is the hump mold just after I have shaped a dish. You can still see the ghost image of the combed slip. Below are the molded dishes aprés Bandana. Stacey thought they looked too much like Michael and Naomi's pots. I said, "Oh good!!" I don't think she knew that it was covers week here at the pottery. And what would be so wrong about that, anyway? 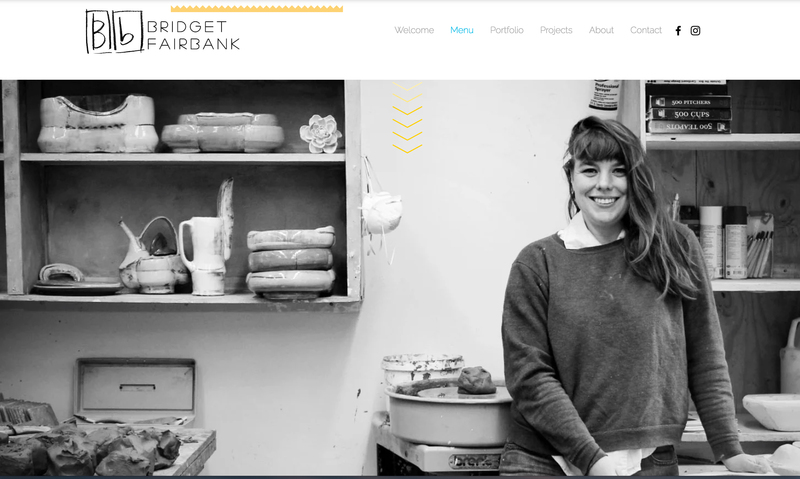 I guess this idea of originality is a problematic one for us potters. 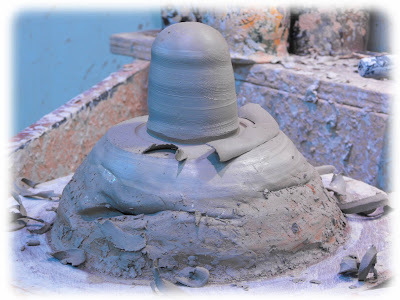 The cup shape grew into a vase shape quite naturally. Here are a couple that asked for ears! 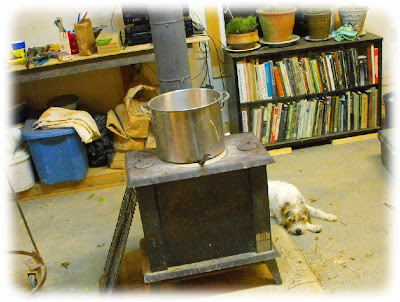 After that I was back at the treadle wheel for some more trimming. I took the still soft chuck I used for the bottle/vases and reshaped the top to accommodate the MSimon cup covers! The updated chuck's effectiveness was marginal but it worked and I got them done. The feet were tricky. 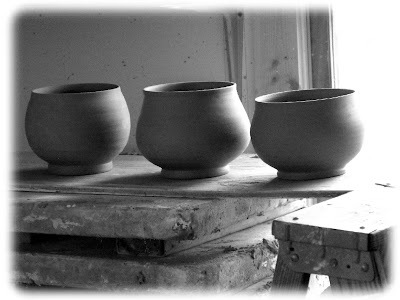 I soon found that I had looked closely at the finished fired cup when throwing these, but hadn't looked closely enough at the foot. 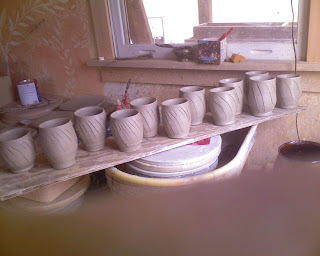 For most of these I had left too much clay in bottoms which needed a lot careful tweaking to get the cups where they wanted to be. A process that made the feet look a little overwrought. Most of them were taller and narrower in proportion than the original. This one had the nice profile, a decent weight, and the foot was close, but a far cry from Mr. Simon's. The scale is a little off. The scale is one of the things I like about Michael's cup. It's volume is very specific to my coffee in the morning or a good gulp of water. My version will hopefully find a home where it is "just the thing". For me, it's back to the drawing board, or rather, back to the wheel! It's getting on noon and here I am at a keyboard! Don't forget to take this weeks poll! Just a few hours left! Scroll down and you'll find it on the right hand sidebar. Thanks. My parents don't give me enough allowance money. I do the dishes every day. Most of my peers are getting twice or three times what I get. Its not fair. What should I do? You know a lot of potters feel this way. Never getting paid enough for doing the dishes, while friends in other jobs earn a lot more money. Why do we persist? We do it because we love it. I mean look at these great plates by Bernadette Curran or Sam Taylor. These are nice plates, a pleasure to use or even wash if that's your thing. 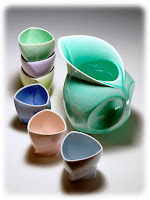 Or this set by Sylvie Granatelli, what fun. I suggest you throw yourself into doing the dishes and soon you will feel like a kid again. A friend of mine recently told me she does not believe dinosaurs ever existed. Furthermore she believes the earth is only 6.000 years old!?! This woman is obviously crazy, but she won't believe me. What can I tell this woman to persuade her to believe in the once dominant existence of these impressive creatures? Your letter really made me angry. 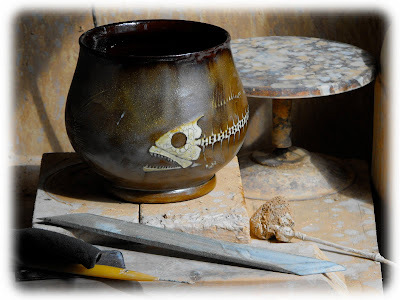 Yes I know that some people think pottery is archaic and anachronistic, but calling us dinosaurs gets us nowhere. Since receiving your letter I have done a lot of reading and reflection on these issues. I have to say that I don't think there is really anything to argue about. When it comes to choosing between a mass produced mug with a logo and a lovely hand made mug by Nick Joerling, his piece is the natural selection. That being said; I am a firm believer in intelligent design. I mean poorly thought out pottery is so disappointing. David Pier's work is so smart and well made; it doesn't really matter to me that it wasn't made on a wheel. 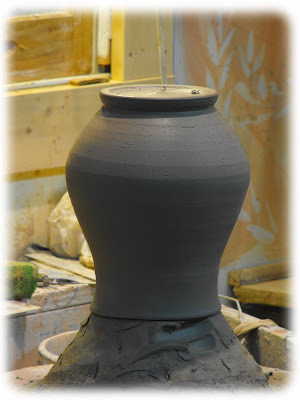 It's wrong to say that round pots are better just because they are more fully revolved. 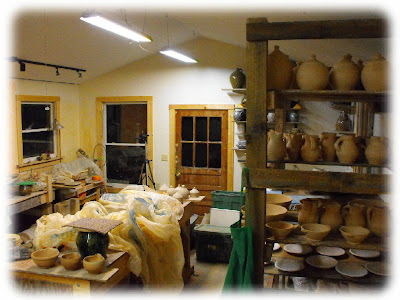 I know pottery's heyday has passed, but it is still a vibrant field full of innovation and history. 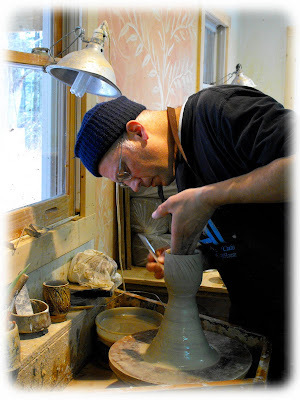 There are so many wonderful potters who have resurrected the art of clay, and there are potters who's work is filled with revelations. I think if you can save your friend from her misconceptions we will all prophet from your efforts. Good luck and good potting. Just time for pictures and captions. Too many thoughts, so little time to write them down. 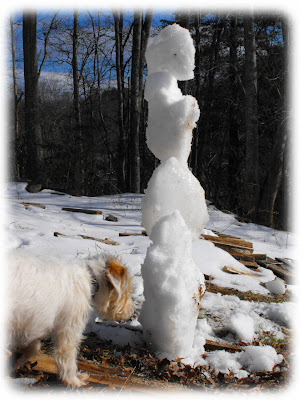 Maybe we'll have a snow day soon and I can sit down to expand on some of the things I've meaning to share with you. For now, some views of the shop from today. my buddy Peter Karner made the cover! 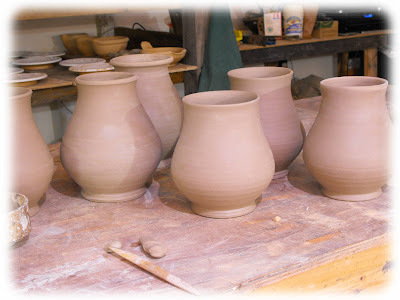 I'm proud to see his beautiful pots. the rim of this cup gets a little bumped around while I flute the sides. 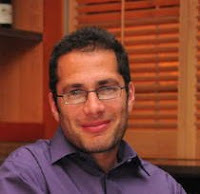 Michael Simon a few years ago. I've been slipping with posting. 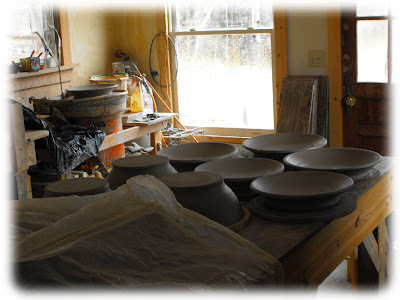 I guess there haven't been enough snow days this week to keep me from doing pottery work. I have been busy chasing the plastic! 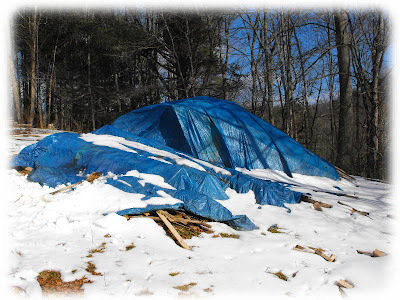 To take us back a few days, Saturday I spent outside in the beautiful warming trend and began to uncover the wood pile that I had covered with a most beautiful blue tarp. 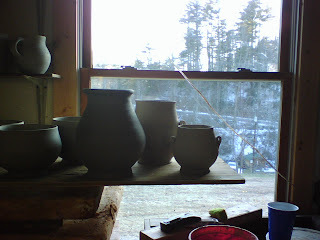 I also cleaned up around the kiln area picking up all the stuff the wind and snow had played with over the past few weeks of old man Winter. 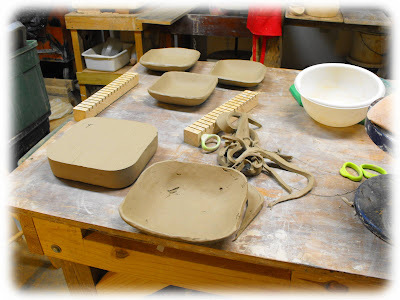 I have dedicated this week and some of last week to being a pottery version of a cover band. 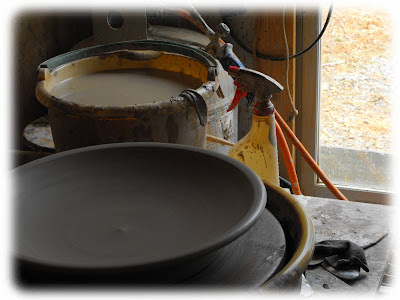 It all started with the batter bowls and continues into this week with favorite pots that friends have made and I am giving a spin at. 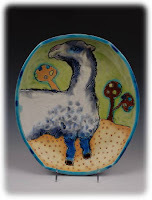 These include a hump molded dish aprés Bandana Pottery that I have revisited from time to time over the last few years. Another of the cover pieces is a bowl/vase pot from Bulldog Pottery that I got a little while back. I was reminded of Bruce's pot after looking at my jars upside down and that alternative form. Here is that board of jars upside and drying. And here they are right side up with knobbed lids. Here is Bruces jar/bowl/vase. 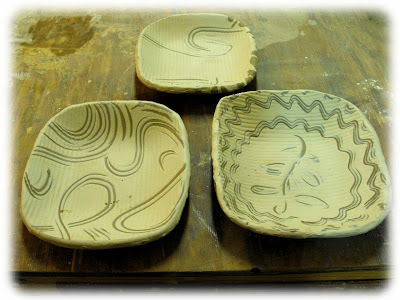 The following are some of the bowls that came from covering Bruce's. They're not exactly like Bruce's but I wanted to show you how I am taking the form and interpreting it and later I will show you what happened by the time I had made a dozen! 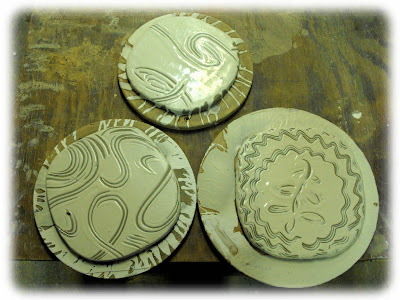 I couldn't find my Bandana Pottery dish that I'm covering here, but I found the old bisque molds that I had made a few years ago. 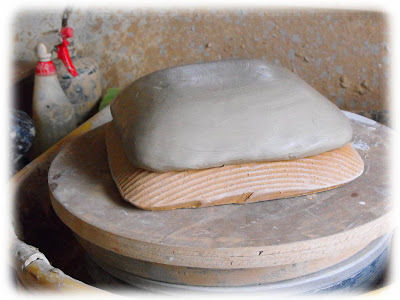 I decided to make a hump molded dish and used a Mudtools wavy wire tool to cut the slab. 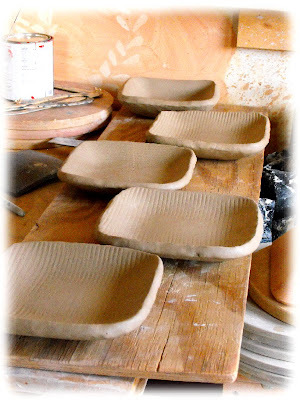 Then I let this molded dish dry a little and am using it to mold the final dishes. Here are some pots I covered after Ron's videos last week. There were a lot of fun, but weren't as easy as Ron made them look! I'll definitely make more of these soon. It's a whole lot of fun and the problem solving and shape solving is very interesting and speculative from my point of view. I am guessing at prethrown weights and the scale of the pots are varying. I'm sure you've tried this once or twice before. 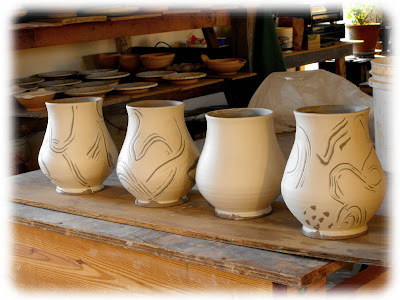 If not, why not pick one of your favorite pots from your cupboard and try to make it. 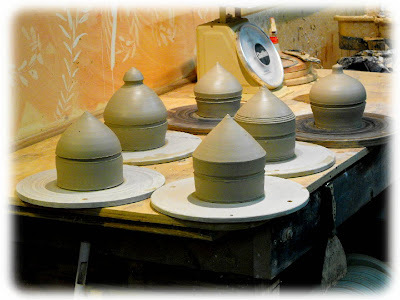 That how all these great pots are kept alive for the generations to come. 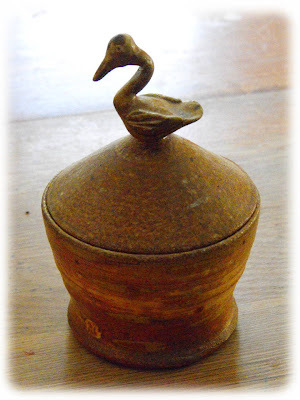 Here's one our favorite little sugar jars, similar to Ron's knobandall! 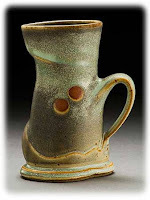 This one was made by Douglas Rankin and/or Will Ruggles, of Rock Creek Pottery. All of this mimicry is related to a conversation that has been happening over at Kristen Kieffer's blog on signature. I am working on another post about finding one's voice and signature style TBA. But for now I thought I would just stick my head in the blog door and say hello and show you what I've been into the past couple of days. Howdy. Just checking in on this Saturday morning. 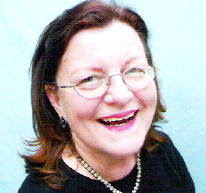 I hope everyone is enjoying Ellen Denker's posts. I 'm thrilled to have her posting here! Thanks Ellen! and now the little covered jars aprés Philbeck! Maybe I'll called this series the "aprés" line! Has a nice allure, hinting at "style". [drats, there's that word! I'm still crafting a post on that topic for next week] I did just what Ron warned me not to, I think I threw them too thin. When I did the credit card move (ribbing the little band around the waist of the pots) I had a bit too much flex/movement. It's a cool pot and I really liked the direct nature of the technique! We'll see what I say when I try to finish them. ha. Ron's videos (part 1 and Part 2) are very well done. Check'em out! I'd better get a video camera so I can keep up with these vlogger/potters!!! Ron's was a fun assignment, just in time for the boxes I'll be making for an upcoming show at the Crimson Laurel Gallery. I hope to use some part of this technique for the boxes. 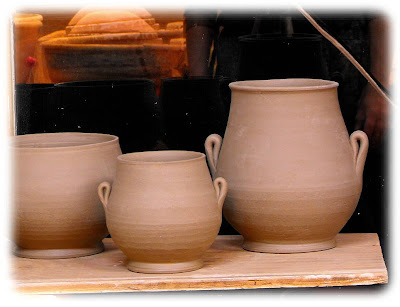 Really, though, I wanted to show you this little series of jars, shown above, turned upside down. 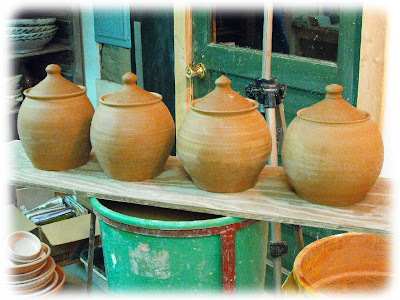 I usually turn my pots over as soon as I can without denting the lip to slow down and even out the drying. After I flipped these and flipped their lids, I flipped mine! These look better upside down that right side up I think! What do you say? Let me know (if you would be so kind). For now, there is the beautiful sunshine to go out into and much plastic to chase for this weekend warrior. 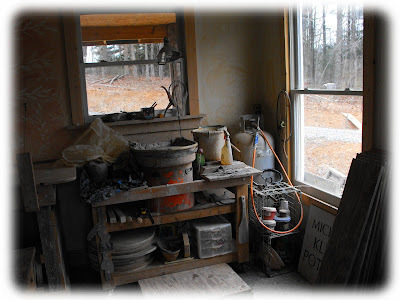 Stacey and the gals are visiting Grandmother's house (over the mountains and through the woods) so I'm cranking up and focusing on some clay! P.S. see my new poll on lower right sidebar! 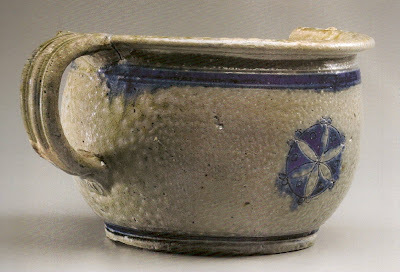 When Michael was experimenting with new handles for his handled bowls last week, I decided to look up the same form in a new book recently published by Colonial Williamsburg on early American stoneware. The closest I could come is something called a porringer, an all-purpose vessel for eating wet food mixtures (such as stews, oatmeal). For example, Ben Franklin in his autobiography mentioned eating breakfast of gruel or bread and milk out of a porringer. 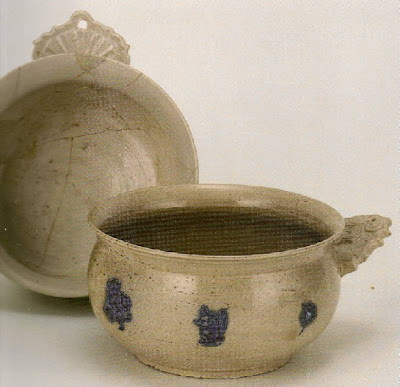 The only ones shown in this new book were made in England of white salt-glazed stoneware. 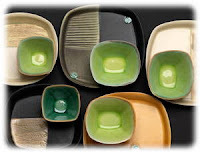 We would more likely find the precedents for Michael’s bowls in a book on earthenware rather than stoneware, but looking there would not provide a convenient segue into my review of this new stoneware book. 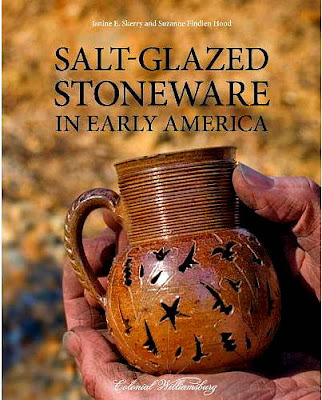 The authors of this handsome volume take a broad view of stoneware in early America. Their time period is before 1800, which covers more than 200 years of colonial occupation. In addition to discussing the stoneware made in the American colonies (American-made stoneware is all from the 1700s), they also cover the English and German stoneware used in America. Their evidence comes from complete objects that survive with histories of ownership in the colonies, many shards recovered from archaeological sites, and colonial inventories. 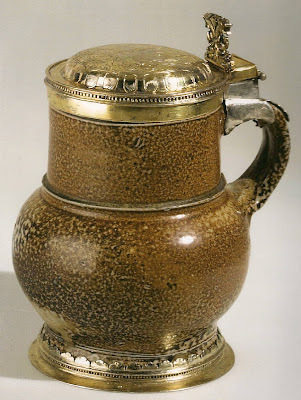 Their searches yielded some remarkable things; like the German mug made 1550-1575 with engraved English silver-gilt mounts for the cover, rim and foot, and carried by John Winthrop, future governor of the Massachusetts Bay Colony when he crossed the Atlantic in 1630. John was not the first Winthrop to own the mug, nor was he the last. 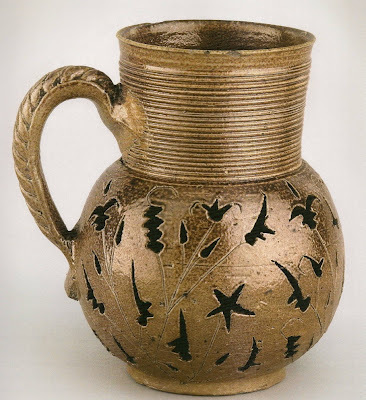 The mug continued to be passed down through generations of the Winthrop family for another two hundred years, until it was given to the American Antiquarian Society in 1825. Without the silver mounts and the long Winthrop family history, this is otherwise a rather mundane mug made in Cologne or Frechen of grey stoneware body coated with a rich brown slip and fired with a salt glaze. 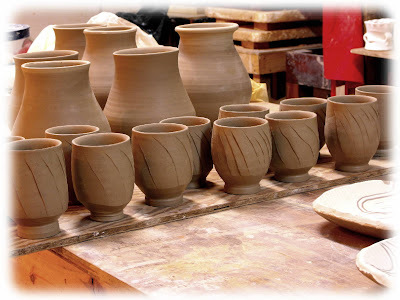 Surely the potter who made it thought of it as nothing more than one more piece qualifying for his daily count. Yet it was held in high esteem in the sixteenth century (the English silver mounts tell us that) and acquired magical properties as it was passed from generation to generation of Winthrops, each passage carried out on the Feast of St. Michael (Michaelmas recognizes the coming of autumn and shortening of days, while celebrating the accomplishments of Archangel Michael, who defeated Lucifer in the battle for the heavens). The whole story made me wonder whether any of us would want to set ourselves three hundred years hence to see what has happened to our own objects. The story above was not meant to put you off your wheel, but to let you know what sorts of things you will see when you page through this book – common objects like the ones handled every day by colonial forbears: Jugs, jars, mugs, pitchers, plates, crocks, tea and coffee wares, chamber pots, and a few figurines and ornaments. Some are remarkable, like this carved cup made in Nottingham, England, about 1700. 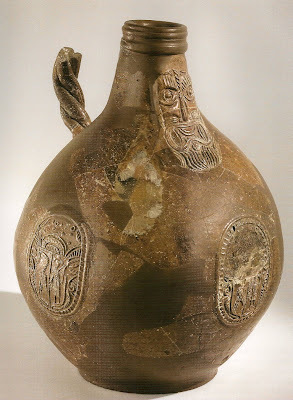 The authors also examine the elaborately decorated German wares, like the brown bearded-man jugs and blue-and-grey Westerwald medallion wares. 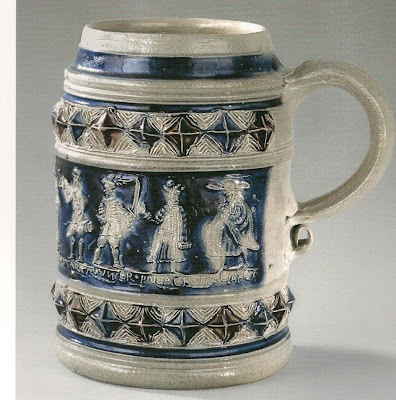 The German potters used small press molds to create the pads of decoration that were typically applied to the leather-hard jugs, bottles and mugs. 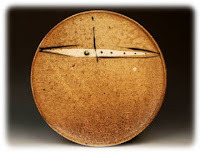 For those of you who try to follow Bernard Leach’s admonition to look for inspiration at historical wares made in your region there is also a chapter on American-made stoneware, especially from Yorktown VA, Philadelphia, New York City, Connecticut and Boston. In addition, an appendix lists the names, dates, and locations of all the known American stoneware potters of the eighteenth century. 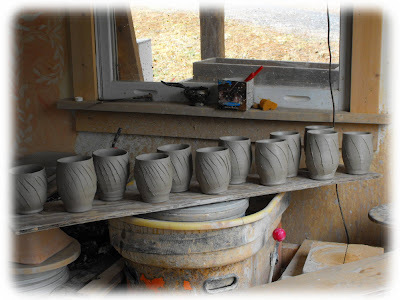 Only Delaware among the thirteen original colonies did not boast a stoneware pottery, so if you are resident of the states touching the Atlantic you have stoneware history to mine that goes back to the 1700s. 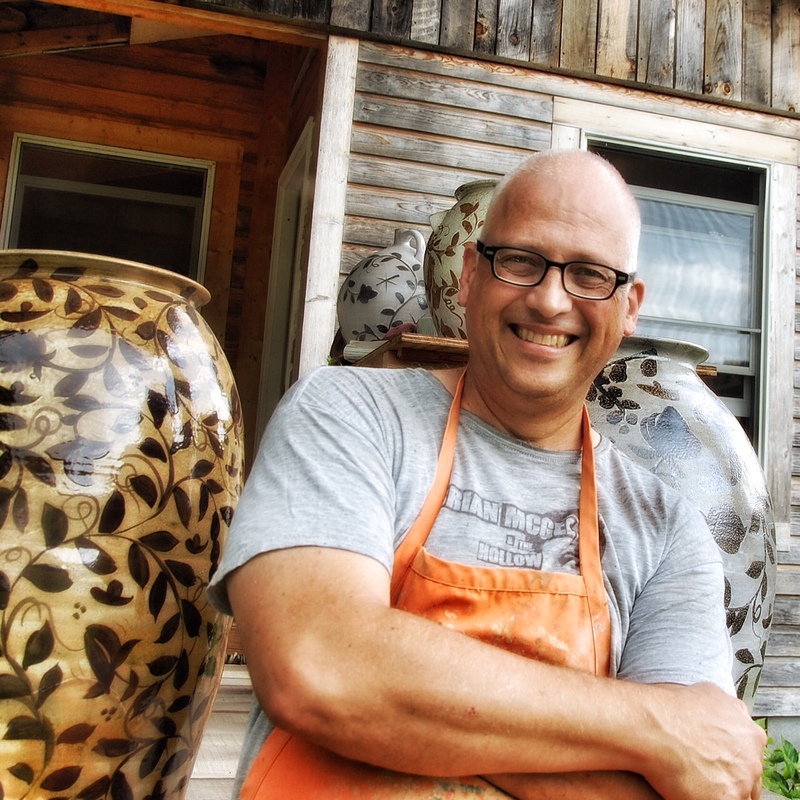 Although this book was written for cultural historians and stoneware collectors, there is much here to be admired and learned by contemporary potters with an interest in the products of historical kilns. In addition, an exhibition in the DeWitt Wallace Decorative Arts Museum at Colonial Williamsburg (“Pottery with a Past: Stoneware in Early America”) will be on view through January 2, 2011, which gives every reader of this book the opportunity to see first hand many of the wares illustrated in the volume.